This past Friday I finished the five-week creative writing course I took. It was a wonderful, challenging and engaging five weeks and I did things I had never done before with writing. I’m so glad I decided to go for it. I’m finding my writing practice has already developed into something new and different and I’m writing (mostly for myself) a whole lot more. After the course finished, Amanda put up a November writing challenge. To take the prompts here and write every day in the month of November. I went back and forth wanting to do this and not wanting to get involved in something else that required more time, but when it came down to it, I felt like after taking the wonderful course, I couldn’t just stop writing, I had to continue and with verve! This would be the perfect practice to keep me going (at least at a steady pace for one more month). So, I will share some of my work here and some I may just keep in my private writing journal. But, I will be writing every day, using these prompts, telling stories with pictures or just with words. You are welcome to join me. If you are interested, head on over to Amanda’s new website for more information. Happy November! Here is my first day of writing…. A first trick or treat for this girl. 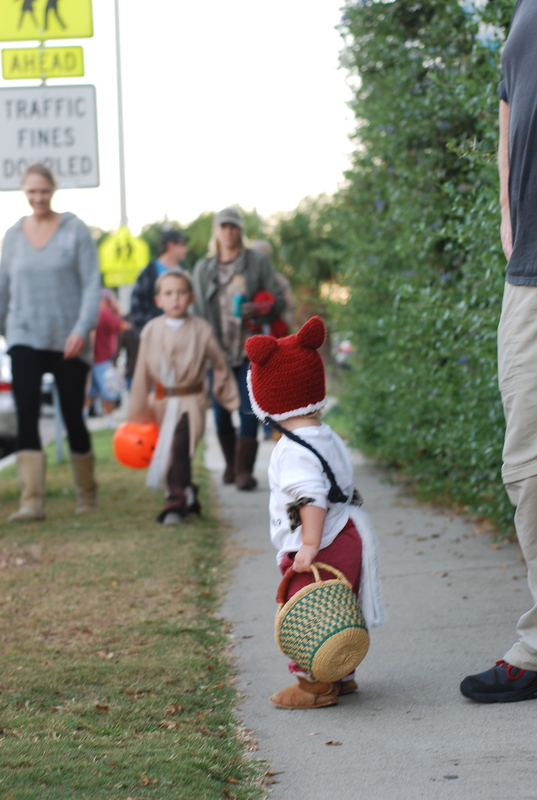 Dressed as a fox, she carried her basket down the sidewalk, watching the other children scurry past her in their costumes. 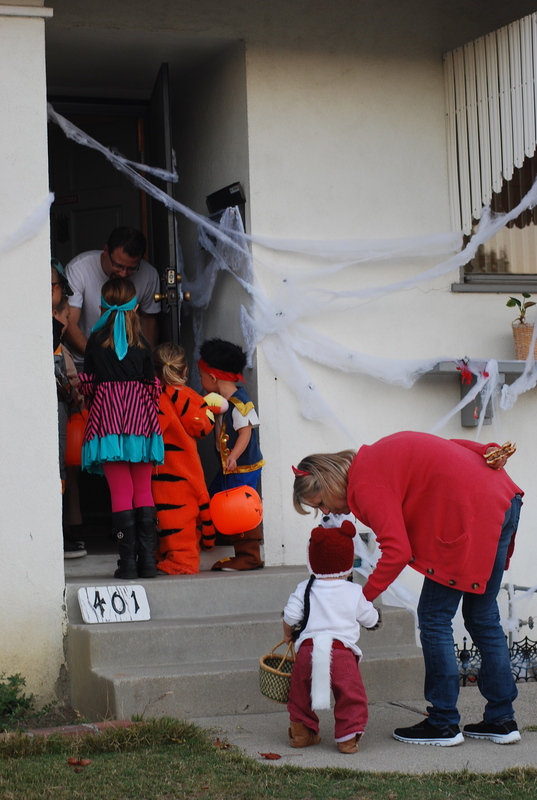 The buzz of excitement filled the air and we watched as she followed the neighborhood children up to the first house. 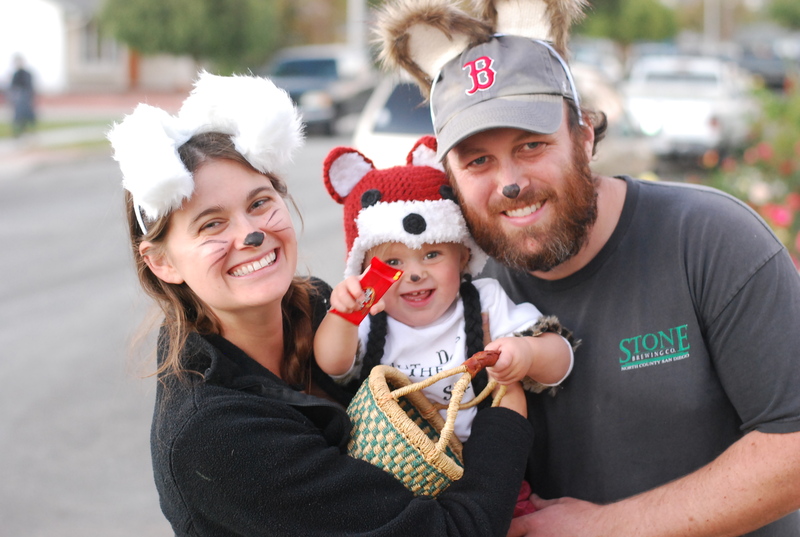 Laughter and shrieks of “trick or treat” from the older children, I thought for sure would frighten my little fox, but she was brave and curious and stepped up to the next house and the next house. Her eyes lit up as crinkly, multicolored mysterious objects were tossed into her basket each time she went to a door. 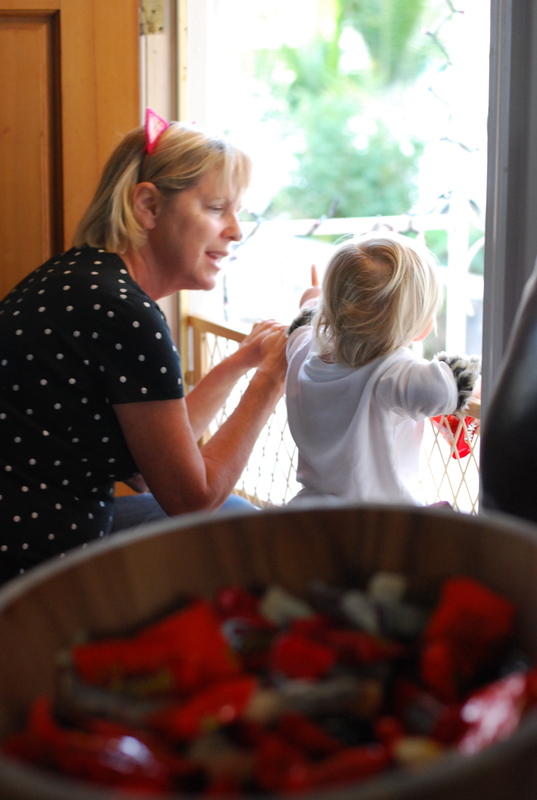 She would grab one piece of candy out of her basket and then another, holding onto them, savoring their newness. The excitement only lasted maybe twenty minutes before her little legs were exhausted and her tired eyes told Mama it was time to head back home. It was an exciting first Halloween for this little girl. 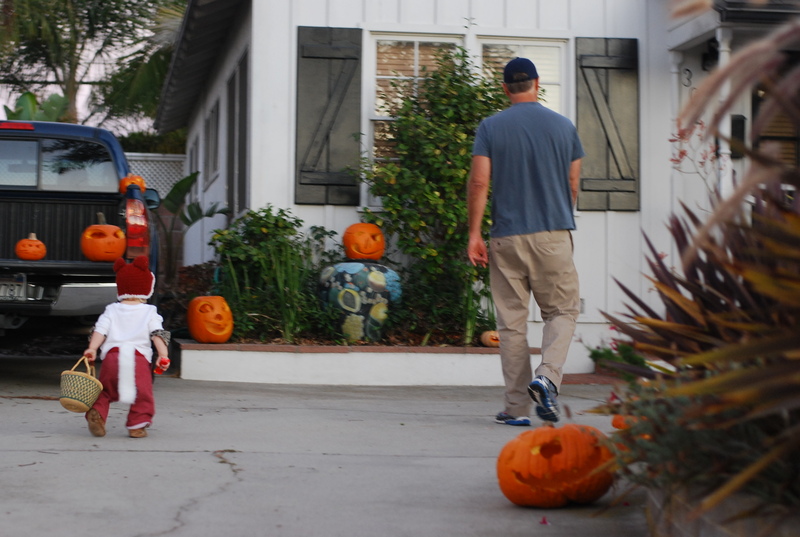 And a wonderful first Halloween memory made for this Mama. This entry was posted in November prompt a day and tagged #writealm, first, first halloween, November prompt a day. Bookmark the permalink. 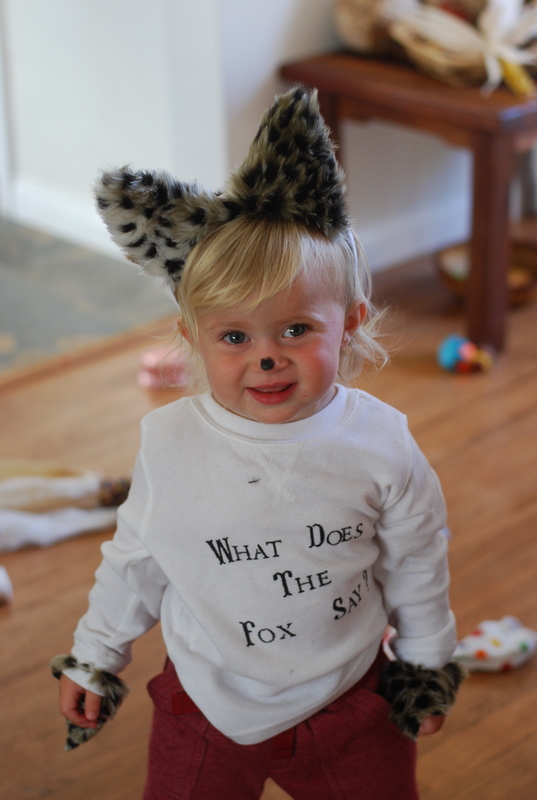 I love the costume, love the shirt, love that silly song. I love that you want to keep writing and writing with verve! Such a great word. Adorable fox! And I’m so glad you’re still writing! you are doing it my dear! diving in. I love it. and the photos are great, too.